There’s no better inspiration to get outside and work out than a long, cold winter. If you’re ready to get off the “dreadmill” and bust out to work up a good sweat, these outdoor workout opportunities in the Columbus area are calling. And a bonus — many are free! Set the tone for a relaxing weekend with Motivation at the Station. Get your om on with free yoga on Saturdays, June 9–August 4 (except July 7); 8–8:50 a.m.
Yoga on the Square lets you put strength, flexibility and conditioning to work on Friday mornings. Free classes begin June 1 and run through September 28; 8:30–9:30 a.m. Looking for a little more adventure? 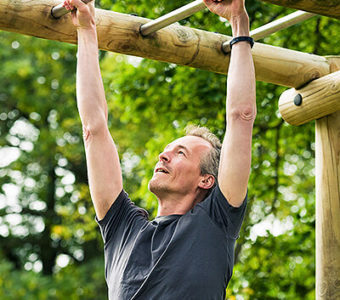 Channel your inner American Ninja Warrior at Scioto Audubon Park’s obstacle course and rock climbing towers. Climb, crawl, lift, flip and run for a heart-pounding workout. Mix up your workout routine all week long with yoga, hip-hop, boot camp, kickboxing, Zumba and cardio classes at Columbus Commons. Two sessions of free, Tuesday, Wednesday and Saturday morning and evening classes, May 6–June 10 and August 5–September 30. Dubbed one of the fastest growing outdoor watersports on the planet, stand-up paddleboarding (SUP) hits a trifecta, combining outdoor fun with fitness and friends. SUP Columbus covers all levels, from lessons to paddleboard yoga, fitness and race training. Who says weight training has to be an indoor, smelly-gym sport? You can pump iron outside year ’round, thanks to the outdoor alternative at Coffman Park. Season-hardy equipment includes weight training and elliptical machines. Outdoor exercise equipment is waiting for you citywide, thanks to Columbus Parks and Recreation. 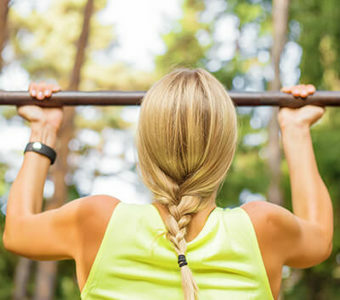 Not only can you take advantage of all the outdoor activities parks traditionally have to offer, you can get your weight training in, too, at six parks throughout the city. Ready to really get a taste of nature while you work out? Take on the miles of trails in Hocking Hills and take in towering trees, rocky cliffs and waterfalls — Mother Nature at her best! Hitting the park with your kids? Check out our playground workouts – Workout 1 and Workout 2!